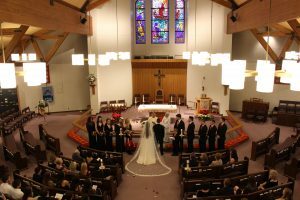 The Celebration and Blessing of Marriage service is a momentous event in the life of any couple, and we at St. Thomas the Apostle want to do everything we can to make it a joyful, memorable and holy event. We look forward to working with you in the planning of this holy sacramental ceremony. We pray that God will richly bless you during this time of preparation and over the entire course of your life together. For more information, please take a look at our Wedding Booklet or email Fr. Mike at rector@sttaec.org.